MaryAnn Nichols A’68 was selected Alumna of the Year in 2013. 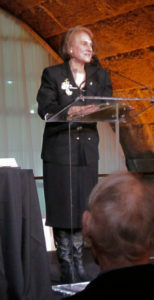 MaryAnn Nichols graduated from the School of Art in 1968. She is an award-winning designer who specialized in corporate graphics and communications and now manages her husband’s business. MaryAnn has also been a contributing author for books and publications on graphic design and typography. MaryAnn has served our community as a member of the Executive Committee, chair of the Nominating Committee and Annual Fund, chair of the Founder’s Day Dinner Dance and Alumni Day planning committees, Vice President of the Faculty Liaison Committee, Vice President of Alumni Activities in 2009, and President of the Alumni Association from 2009 to 2011. As a leader and active member of the Cooper Union Alumni Association, MaryAnn is extremely warm and engaging and makes all alumni with whom she interacts feel welcome. MaryAnn helped organize her class’s 25th, 33rd and 40th year reunions. During MaryAnn’s tenure as CUAA president, the Alumni Association held close to 4o events a year. It also hosted the one and only All Cooper Union Reunion in October 2009. Over 500 alumni attended that event. MaryAnn presided over the opening of Alumni Terrace on Saturday, September 12 2009. 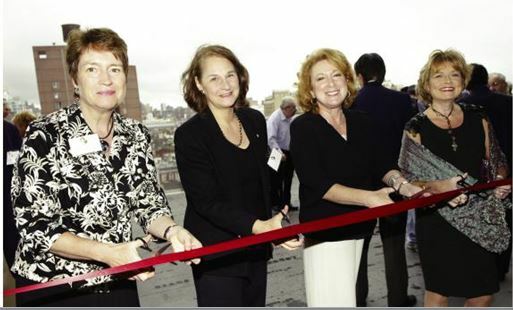 The Alumni Roof Terrace is accessible from the 8th floor of the new building, and it honors The Cooper Union’s alumni and supporters, both past and present. MaryAnn worked in support of our first ever Cooper Union Film Festival, and the current CUalumni.com website launched during her tenure. MaryAnn combined several of her talents when she designed a stunning crystal award, engraved with an inscription which she had written and also presented on behalf of CUAA to Dr. George Campbell as an honorary award at the Founder’s Day Dinner in 2011. Today, MaryAnn continues to serve as an active member of the Nominating and Communications Committees, writing an article for nearly every edition of the newsletter. This entry was tagged MaryAnn Nichols. Bookmark the permalink.